In 2019, you can run into a digital video game marketplace and trip over a game in the “Metroidvania” space. After years in relative obscurity following the age of the classics, this genre has made a monumental comeback due to prolific indie developers, old school creators and even AAA games in some respects pushing this stuff into the limelight. The best part is, the talent pool in these spaces is so dense that most of these games are almost awesome by default. The problem is that space is getting increasingly crowded, and games that aren’t excellent are at risk of being left behind. That’s the unfortunate case here with JackQuest: Tale of the Sword. It’s a small, cute game that is admirably earnest, but it trips up in too many places, and doesn’t stand out enough in others to be a game I can recommend with any enthusiasm. JackQuest starts like many old school romps, with a guy, a girl, and a monster who kidnaps the girl. Jack, who has an adorably bouncy afro-like deal going on, jumps down into the cavernous abyss after the two, and video game happens. Jack finds a talking sword that’s as big as he is, and what ensues is an exploration adventure featuring evil monsters and wildlife, upgrades, death traps, and more. It’s a pretty typical Metroidvania adventure, and that’s part of the problem. Like I said earlier, this is a crowded space. And each new game in this space has done something to make it stand out among the others. That includes things like setting, tone, and distinct gameplay elements that set each one apart from the others. From Dead Cells to Axiom Verge, you can pick these out from a lineup. JackQuest looks and feels much more shallow and generic, like while many of these projects are made by small teams and in some cases even just one person, JackQuest is the unfortunate one of the bunch that feels like it. Speaking of “feels,” JackQuest also suffers from some gameplay problems that make everything in the above paragraph stand out even more. First, Jack himself feels a bit too fast, a bit too heavy. What does this mean? 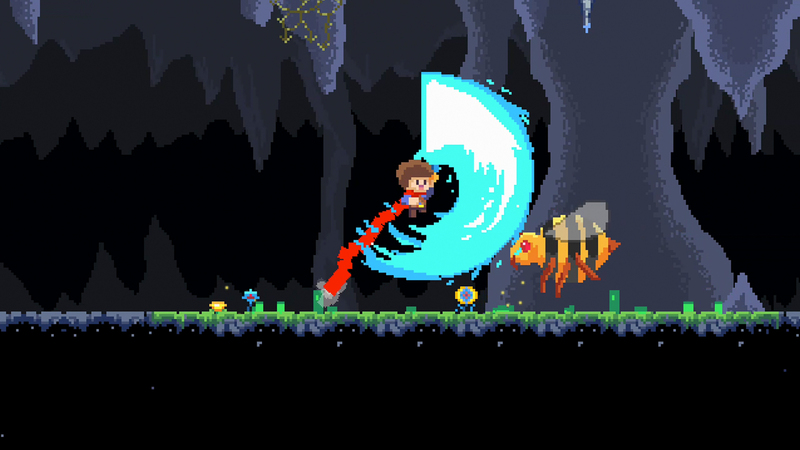 JackQuest is designed around wall-jumping. In this respect, it’s more like Super Meat Boy than say, Super Metroid. Jack can actually scale a single wall without needing to go back and forth between two, because he gets enough momentum to launch himself upwards. However, he also sinks in the air like a brick. That sounds contradictory, and that comes to an ugly fruition when you’re trying to make precise movements. For example, dealing with a simple situation such as an enemy hanging above a small platform becomes much more of a challenge due to how slippery Jack handles. It’s like a cartoon character trying to hold on to a bar of soap. Compounding that control difficulty is the camera. One thing I do enjoy about JackQuest are its visuals. Everything is clear and immediately digestible, from enemies to hazards. Sprites are big and colorful, with a surprising amount of animation in contrast to their simplicity. However, the camera is very zoomed in on those big sprites, and since Jack is so fast and slippery it can be hard to see where you’re going. You can’t really get in the zone here, as it’s easy to bump into stuff ahead of you if you’re going too fast. The game even knows this, and wants you to stop and stand on ledges so the camera can slowly creep down to show you if you’re about to fall on some spikes. Of course, you’re S.O.L. if you’re moving up or sideways. Finally, there’s the map. The map in JackQuest makes the Metroidvania junkie in me very, very sad. So in a classic sense, a good, satisfying Metroidvania on a basic level incorporates a large, detailed map as part of the gameplay/feedback experience. Part of the appeal is filling that bad boy in as you explore that space. Now, a “ripped straight out of Super Metroid” map isn’t necessary, as demonstrated in games like Hollow Knight, but when you mess with that part of the formula, it’s a big risk. The risk taken here doesn’t make much sense, nor does it add value to the game. Once you get a map, it comes in the form of a crystal ball. When you look at it, you can only see a part of the map, but you can move that window around. So technically you can see the whole map anyway, but it’s obscured in its entirety. The map itself is also super low on detail or rather clarity, visually resembling an Atari game. It’s muddled and obtuse for no discernible reason, but since you need to look at it anyway, it still contains normal, mundane details. Fighting against the game for it doesn’t add an air of mystery or atmosphere. It just is, and what it “is” is frustrating. I’m ragging on JackQuest a lot here, but to put it plainly, JackQuest doesn’t make a great case for itself. It feels like an earnest project inspired by the titans before it, but it doesn’t have nearly the same juice behind it. From a lack of interesting narrative hooks to several gameplay issues that make playing it feel like a chore, JackQuest just manages to miss the mark on a fundamental level. JackQuest: Tale of the Sword review code provided by publisher. Version 1.02 reviewed on a Standard PS4. For more information on scoring please see our Review Policy here.